All of us are familiar with the Guggenheim, but how many can say the same about the visionary who moulded its design over 16 years? Last month, the count of those acquainted with Frank Lloyd Wright’s legacy increased by roughly 84,000, the number of views clocked by the black-and-white video shared on the museum’s Instagram, to honour the architect’s 150th birthday. The post was meant to pull traffic towards a Facebook Live tour of the NYC landmark, scheduled for that very day. And pull it did, with ‘visitors’ from countries as far away as Serbia and Italy turning up for the event. Access to the art world wasn’t always this fluid. Till the turn of this century, an elite circle of gatekeepers — influential museums, galleries, dealers, critics and academic institutions — outlined the limits and movement of art. Anything nontraditional (like graffiti and pop art) was denounced as non-art. The former was accused of glorifying vandalism while the other of consumerism. In a stifling environment like this, it was only natural for a gamut of enterprises — auction houses, resources, 24-hour news wires, advisers; discovery, renting and trading platforms; as well as apps and social media pages — in the hunt for alternative pastures and ways to engage with the youth, to stray towards the virtual space in search of a more democratic environment. And the web, in return, has lived up to its promise of transparency, painting over in bold strokes both the aesthetics and the economics of art; making it palatable and relatable to the common man and the youth, the buyer and the seller; forever altering how it is viewed, followed, appreciated and engaged with. At the crux of the move is a desire to spark unhampered exchanges. So virtual art marts, thanks largely to the low cost of setting up shop online, are tapping into the demand for inexpensive art, a more inclusive model of business that pulls independent and even amateur artists into the conversation. Aiming to ‘reinvent the art buying experience’, online gallery Tappan Collective’s artworks start at 100 dollars on an average. And their gift cards are a steal alright — from 25 dollars and up — as is their ‘store’, an online equivalent of a museum gift shop, where prices drop further, to 10 dollars. Meanwhile at auction house and educational resource Artsy — one of the most popular and powerful portals on the net — you can pick up limited-edition prints, sculptures and framed photo prints for as little as 50 dollars. If it’s Indian artists that you’re after, turn to Saffronart’s live online auctions. Or sites like Global Art Hub. While you can spend hours browsing through partner galleries (that sell fine art worth up to 1.5 crore rupees), it’s GAH’s aspirational ‘affordable’ section, filtering works between 10,000 and 45,000 rupees — a growing multimillion-dollar market — that is grabbing middle-class eyeballs. However, it must be said that while cultivating tastes and interests is the primary motive, it’s not entirely without the hope that these first-time collectors may, in time, gravitate to a higher price bracket. as both the curator and dealer. Physical spaces will always be necessary — screens can’t replace the buzz and bustle of an opening night at a gallery or the romance of a museum. Digital platforms, however, are zooming in on and bridging gaps, upgrading a conservative industry and providing some solid backup to their offline counterparts. Conversely, many online spaces are also given a hoist by mainstream custodians or arbiters of taste. Heralded as the ‘future of auctioning’, 2011’s Paddle8 is funded by Damien Hirst and gallerists David Zwirner and Jay Jopling. 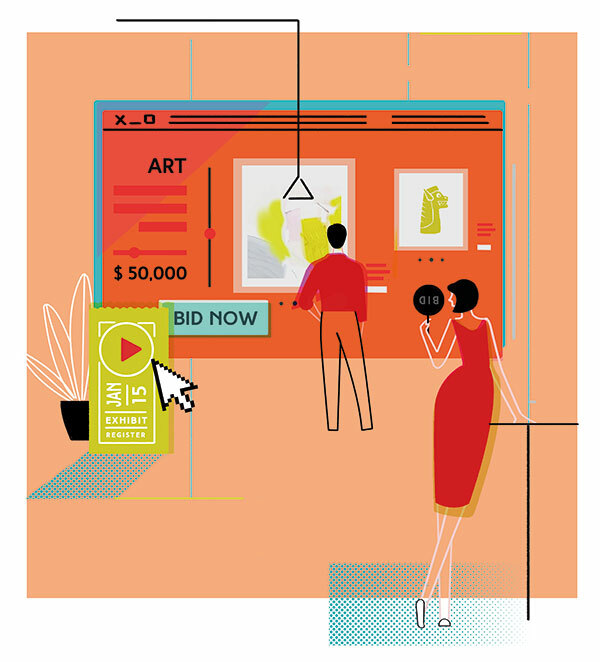 The presence of industry insiders in its corner no doubt allayed any misgivings felt by big-ticket museums and foundations who readily took their charity auctions to its platform even when it was a newcomer on the scene. Criss-crossing online and offline realms, mutually beneficial hybrid models further bolster the point. Tie-ups between galleries and popular Instagram art pages to exhibit the latter’s most ‘liked’ artists have emerged as a trend (one that Unit London is credited with starting), while online entities like Tappan are setting up successful pop-ups to display select items from their online range in an offline setting. Back home, we have trading platform BestCollegeArt (BCA) complementing their online presence with a gallery in Delhi (one that showcases 200 artworks at any given time) where its Emerging Artist of the Year Award winner gets a solo show — the ultimate prize for any up-and-coming artist. Museums, galleries and auction houses all have their own websites and social media presence today, but they are still tying up with online trading platforms by the dozen to ensure a piece of that pie too. Mojarto.com, which sells original art, prints, and collectibles, has an enviable roster on its plate — including Emami Chisel Art and CIMA in Kolkata, Galerie Mirchandani + Steinruecke and Pundole in Mumbai and Delhi’s Vadehra, Latitude 28 and Threshold. Allowing interested parties a peek into a broad cross section of works, it is a bona fide one-stop shop that works well for young netizens hardpressed for time, especially those staying outside the three metros where the major galleries are bunched up. Business is booming for affordable art online. The constant nudging to view ‘fresh arrivals’, participate in quizzes that reveal your ‘art style’, sign up for alerts (that notify you whenever works by a favourite artist hit the market or go under the hammer), try out free advisers and so on — it’s all geared towards enticing online spends. Not surprisingly, international news agencies reported a four per cent rise in online sales — mostly in the category below 50,000 dollars — this March, even as global art sales dipped by 11 per cent. And with sales of artworks priced above a million dollars falling by over 30 per cent — those valued more than 10 million taking an even harder hit — it’s clear which segment is calling the shots. No one can deny that as far as high(browed) art is concerned, the majority of the sales still happen through bricks-and-mortar businesses. It’s human nature, after all, to want to make a big buy only after checking it out in the flesh. Catering precisely to this need of intimacy is London-based e-commerce site Rise Art’s ‘try before you buy’ model which gives the online collector a look at the real thing before making the purchase — and the chance to make up their minds after living with it. The internet takes away the intimidation — liberalising, demystifying and redistributing the soft power once concentrated in the hands of a privileged few. Meanwhile, museums are losing the stronghold they once had, with millennials openly favouring a more multidisciplinary, interactive and non-didactic approach to art. Galleries too have been taking a rap for abetting a culture of exclusion. Certainly, the number of ‘views’ on Instagram or ‘likes’ on Facebook may not always correspond to the actual level of awareness or revenue. But no one can deny the power of social media without sounding outdated in an age where paintings do change hands on comment threads. What Does The Future Of Art Look Like For India?